Chocolate Pumpkin Baked Donuts are full of chocolate pumpkin flavor and are only 1 weight watcher point plus! Looks like you can have your cake and eat it too! Oh my. Do I ever have a treat for you today! 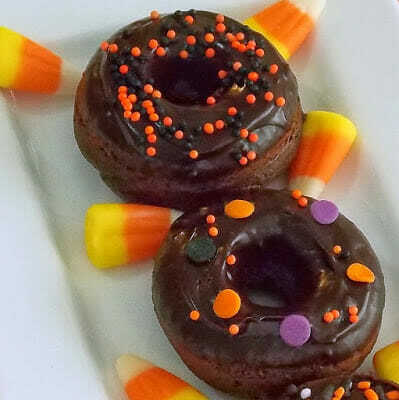 These chocolate pumpkin baked doughnuts are like most other baked doughnuts…the only thing that really makes you “think” you’re eating a doughnut is the shape. But when you can take a recipe, adjust it so it taste fabulous and have it be weight watcher conscious, then you have a winner. Even if it is not fried! The blog I have been stalking this month for my Secret Recipe Club assignment was Cupcake Muffin, written by Sara. Sara has been blogging for just a couple months longer than I have been. She has a massive amount of recipes to choose from on her blog and it was not a very easy decision. Considering I have been watching my food intake and trying to reduce my weight some, I started by looking at all her salad and vegetable dishes. However, by the time I actually had time to make something it was Saturday morning, the weekend of our due date for posting. I happened to look at her baked goodies. The Chocolate Beet cake was very tempting, but when I read about how involved it was I decided that had to wait for another day when I was prepared to spend a lot more time in the kitchen than I wanted to that day. Then I saw the Mini Chocolate Doughnuts. And I started to think. Think about how I could make these and make them Weight Watcher friendly and have them fit into a fall theme. I started to think of ways to cut the fat and still have moist donuts. In comes the Pumpkin. I then decided I would use Splenda Brown Sugar Blend, White Whole Wheat Flour and some International Delight Sugar Free Pumpkin Spice Creamer and Pumpkin Pie Spice. I ran the recipe through the Recipe Builder on the Weight Watcher website and at first I thought, 2 points, not bad. But that was only if the recipe made 12 mini doughnuts. This recipe made 30 mini doughnuts turning the points value into only 1 point per serving! I had died and gone to heaven. I played with the calculations some and found that even if I didn’t frost these donuts, they still were going to be 1 point each, so have your icing and eat it too and still only spend 1 point! This is a perfect recipe for those of us who are dying for something sweet and chocolaty and not kill our diets. Preheat the oven to 350 degrees and spray the wells of a 12-donut mini donut pan with cooking spray. In a medium bowl, whisk together the eggs, milk, vanilla, and vinegar. Add the wet ingredients to the dry and stir until ingredients are combined. Scoop the batter into a large ziploc bag. Cut a hole at a corner of the bag to pipe the batter out into the donut ring. Bake for 7-9 minutes, until a tester comes out clean. Remove donuts from oven and after about cool slightly before turning out onto a cooling rack. Make the topping. Combine the chocolate chips and creamer in a small saucepan and heat in 30 second intervals in microwave until melted. Stirring every 30 seconds (this should only take 1 minute). Dip donuts into glaze, decorate with sprinkles and enjoy! 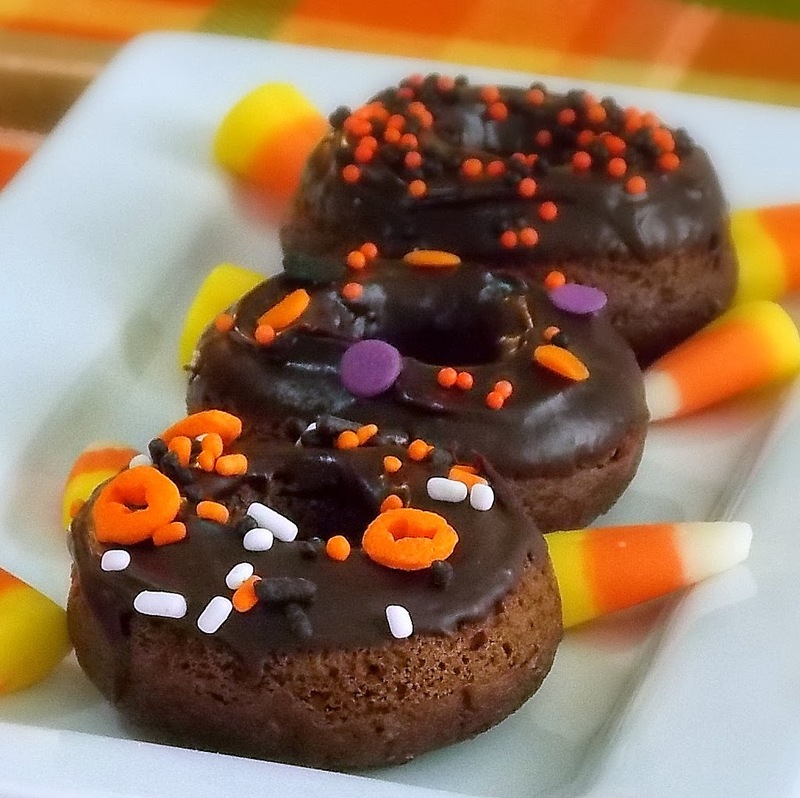 Pin Chocolate Baked Pumpkin Donuts! How fabulously festive…and guilt-free. Wow! Thanks for sharing it with the SRC. 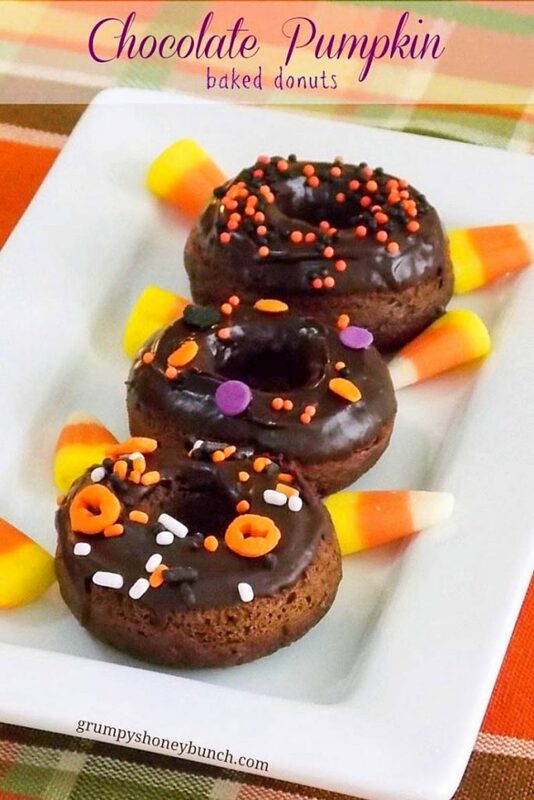 You're all ready for Halloween with those doughnuts. I need to get one of those pans! These look delicious. I just shared your post link to my Weight Watcher's group board on Facebook. Thanks for sharing! I've never made donuts with whole wheat flour, afraid to really. But you say taste-wise they taste great, so I'm with you! When was the last time I had a donut? Please send one of these donuts my way! The colours on that plate look amazing! Great choice. so festive, and I love that you lightened up the recipe! What a nice treat this time of year! nice remake!! On the must make list! I have been seriously craving doughnuts recently, and I may just try to adapt this recipe to be gluten free. They are so cute, and it's such a great idea to bake them. if you dont have white whole wheat flour can you use 100% whole wheat flour instead? or just use white flour? I'm a fan, love baked doughnuts and chocolate makes them a 10+. Thanks for sharing your recipe. Just came from Daily Blog Boost. Am pinning and sharing today on my FB page. Stopping by from Daily Blog Boost… just shared! Sorry if you get two comments–my computer just did something weird and I'm not sure if the first one went through! I can't believe that these look and sound so good and are only 1 point! Way to make it work! Thank you so much for being a part of the Daily Blog Boost! Every time I see these I think to myself "ya killin' me Shelby!!!!" Then I remember you made them LIGHT!! Woohooo I need to make these and soon! Delish!! You'd never guess these beauties were a healthier version!!! YUM! I saw these this morning on Instagram, and I love them! They are so cute! Fabulous recipe and love that you made it healthy too! Very pretty picture too. These donuts look amazing, and I happen to be a BIG fan of the pumpkin and chocolate combo! 😉 Yum! Win-win for sure! I have a mini donut pan that I love to use and you've given me good reason to bake a Fall guilt-free donut! these looks so colorful and festive! I love Halloween!! I need these in my life! So festive! These little donuts look delicious, and I love that they are WW friendly. Shelby, these look SO good and I can't believe they are not loaded with fat and calories. So cute! Pumpkin is definitely a great way to add moistness without adding fat. And you get all that fiber too…BONUS! These look amazing! These look so moist, chocolaty and delicious! and I love that you made them skinny!